It was the bank holiday weekend and the family has left me for warmer regions in the Netherlands. I decided to go sailing, arrived on Saturday evening, and settled in early. On Sunday Conwy HW was at 11:50 so I wanted to be heading out around 10:00. After breakfast I set off with light winds from the North. 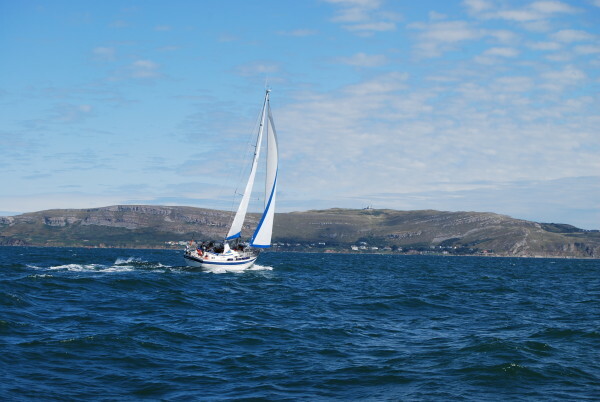 It was a struggle to get through of the narrows of Delganwy, doing 0.4 kts against the current. 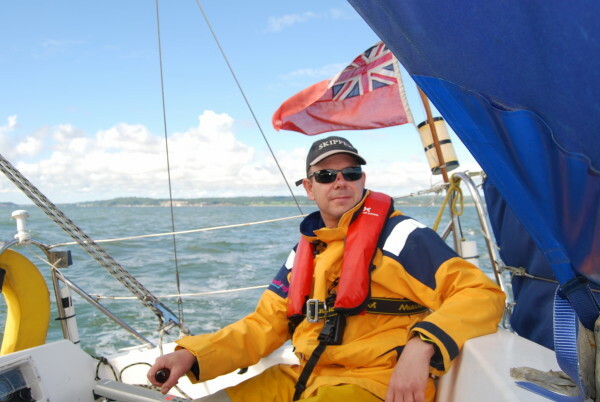 At 10:36 I set course for Beaumaris on the engine and doing about 3 kts. No wind. The forecast was a variable F 3 to 4 from the West. At 11:22 I passed the Penmaen outlet and speed had increased to 4 kts with light wind from the NE. I sailed between the sand banks, through the Penmaen Swatch and got out of the shallow part at 11:30. The lowest depth gauge sounding was 5.8m. Next you turn left towards Beaumaris following the channel. 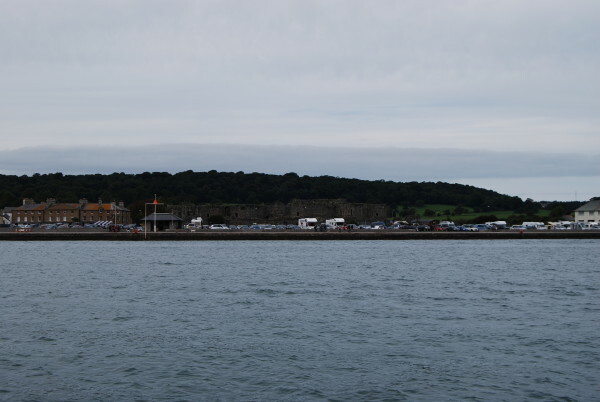 The car park in front of Beaumaris castle was very busy. Looking forward I noticed a large dredger aiming for me, which I thought was unfair and for no reason. With the size difference, I decided to give way, and moved towards the shallower area of the Beaumaris pier. 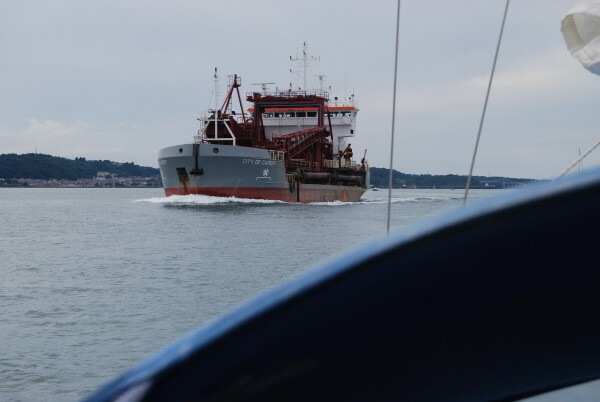 There was a reason the dredger was aiming for me which I found out the following morning. I moored at 13:00 in 15:00m water, so would keep floating all night. 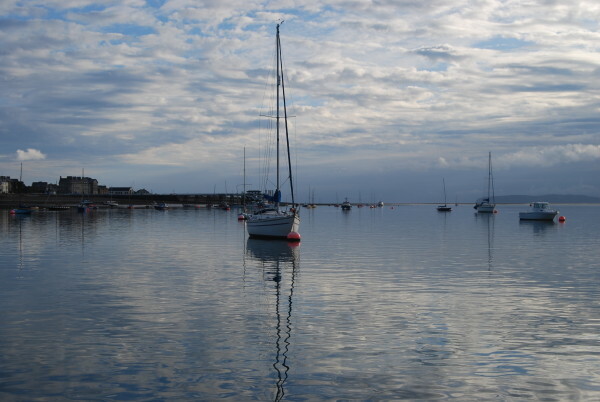 That also ment that the owner of the mooring could come back at any time of the tide and kindly ask me to leave. The trip was 12.4 N and took 3 hours and 20 minutes. I pottered on the boat for a while until the tide was out and current had slackened. I decided fresh spare batteries were needed for the GPS as back up and a landing attempt needed to be made to meet new tribes and learn their habits. I rowed ashore and landed in a slightly muddy patch. 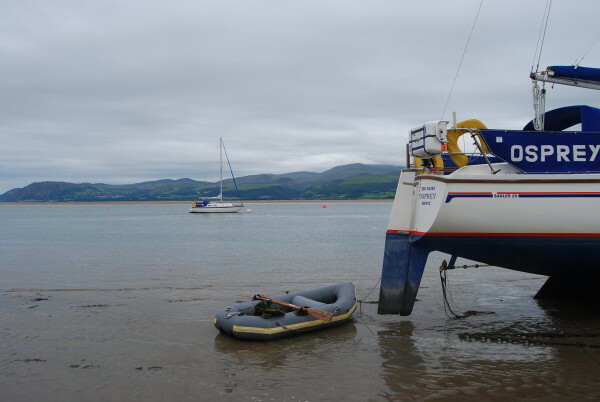 I tied the dinghy to a moored yacht, took a few pictures and then stepped hopeful in the direction of Beaumaris. That direction took me away from the slightly muddy patch into the more customary deep mud. I got stuck in all directions, nearly toppled over and had to admit defeat. Plan B was to row 800 yards down current where the ground was more rocky and from where I could walk to town. Beaumaris town had one Spar still open but no batteries. The only batteries for sale were in the petrol station, which was on 200 yards rowing upstream from my mooring. So it was back to the Dinghy and a long row upstream (current was light). I got batteries from the petrol station at Gallows point and had a nice look around in the yard at other yachts. Woke up early to a complete lack of singing, presents or any other form of celebration of my birthday. Drawback of single handed saling I think. It was a beautiful morning with clouds over the mountains and hazy sunshine. Anyway (is the name of the boat), the night before I'd made a nice passage plan. HW Conwy 12:32 (8.40m). Half tide would have 4.2m of water and take me safely across the Penmaen Swatch. Half tide would be around HW-3h = 09:30 and give me 2.3 m of water under keel. 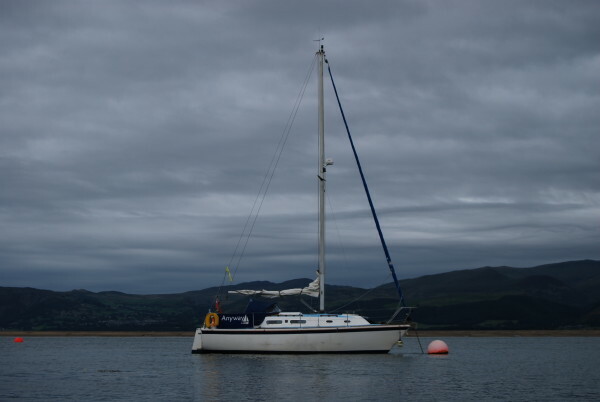 To get to the Penmaen Swatch crossing from Beaumaris one has to sail about 3 NM, which I guessed would be 1 hour on the motor. The reality is always different. As the tide was still not turning at 08:25, I left 30 minutes later than planned at 09:00. After only 3 minutes the depth gauge alarm started screaming (it does that with less than 1 meter of water under the keel). The RED port mark is to be kept on your STARBOARD side when heading out, not to port. 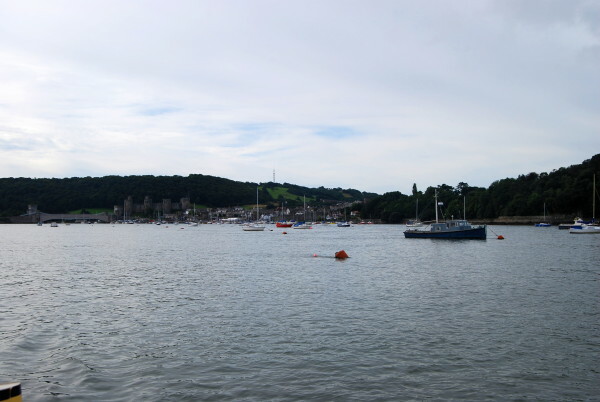 The channel runs really close to Beaumaris. The dredger from the previous day was aware of this and reasoned that it was more likely that I would give way than the sand bank. Experience is everything in sailing. The wind was a good F3 from the North (so dead on the nose). I was doing 2.5 kts on the engine and calculated I needed just over 1 hour to get to B6, where one turns right across the sand banks. However, my speed (SOG) dropped gradually to 1.5 kts at 1500 revs. I am a sailor, so up with the main sail and speed increased again to 3.3 kts. Soon it dropped again and I put the genoa on. Now I had to start tacking. And although I was doing 4.3 kts through the water, I sailed from the red B8 to green B8 channel buoys for 20 minutes, each time setting backwards as much as I gained by sailing due to the current. I recruited as many braincells as possible to work out that in theory I could be sailing here for eternity (ignoring the influence of the moon for ease of analysis). Plan D was then was to sail to the shallow Anglesey side, drop the sails and head straight towards Puffin island with engine refs up. That got Anyway doing 2.2 kts and eternity was postponed. I set 1 reef and started to cross Penmaen Swatch at 1:43 and had 4.8 m of tide. Speed increased to 4.5 kts (engine on and sails up on a beam wind), which I felt was still disappointing. At 11:09, thinking I was out of the Swatch, I set course for Conwy but the depth decreased rapidly from 12m to 4.2 so another course change let me stick a little bit longer to the channel between the banks. At 11:30 I took the reef out of the main sail and engine was killed. Pfffew, that is always so much better. Looking back I could see 2 yacht were following me from Anglesey, through the Swatch towards Conwy. They were faster and started to overtake me near Conwy. Beautiful sight. It took another hour to get to the Conwy channel entry and I dropped the main sail to head to my mooring on engine and genoa. At 12:50 I was back on the mooring. It had taken 3h and 50 minutes which was a disappointment as I had planned my trip to take advantage of the rising tide towards Conwy combined with a beam wind. 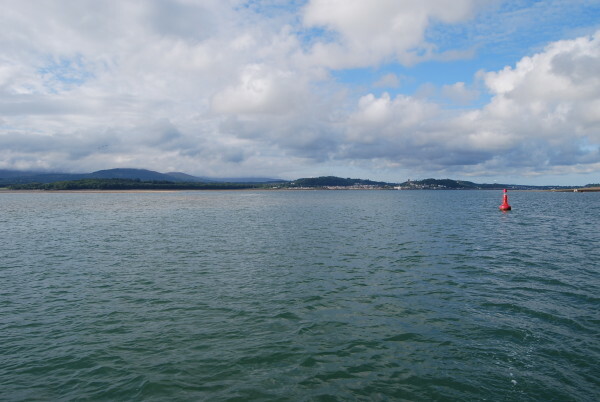 I had seriously under estimated the tide running towards Beaumaris (which was probably doing 3 kts). Anyway (is the name of the boat), I had an excellent sail and headed back home by train. Getting out of the train in Gobowen, it was raining. With no car, I cycled back up the hill, with my peddles strapped along the bike frame, a rucksack on my back and wearing my swimming vest. The sight must have confused a few people.